More people after stroke, more active more often, exercising safely and effectively. The overall aim of this course is to enable Specialist Exercise Instructors and other suitably qualified staff (e.g. Physiotherapists) to design, implement and evaluate physical activity programmes for people after stroke that are safe, effective, appropriate and enjoyable, based on current evidence, and in accordance with the relevant clinical guidelines (1), national service frameworks (2) , national occupational standards (3) (4) and educational standards (5). This 20-credit course at SCQF level 8 (comparable to BSc. (Hons) level 2), comprises a total of around 150 hours of student work. This includes Pre-course learning on our training portal (12-14 hours), lectures, tutorials and practical workshops. In terms of content, the course follows the patient journey from acute stroke through to rehabilitation and referral into an exercise referral scheme. It concentrates on the role of the specialist exercise instructor in assessing the person with stroke, designing and delivering exercise programmes, evaluating their effects, as well as working as a professional as part of a multidisciplinary team. Along the way, the following topics are covered: the pathology of stroke; the input of the multidisciplinary team in the management of stroke; fitness levels after stroke and its impact on function; evidence for physical activity after stroke and the impact of physical activity on risk factors in stroke; indications and contra-indications to exercise after stroke; clinical guidelines; the implications of co-morbidities and medications on exercise performance; motivation and communication strategies aimed at improving health behaviour; relevant professional standards pertaining to ethical issues including; confidentiality and risk management and national service frameworks. The course theory examines the different types and causes of stroke, the impact, recovery and co-morbidities, stroke management services and secondary prevention, physical fitness after stroke, the effects of exercise after stroke, assessment and screening tools and referral guidelines. It discusses the role of the exercise professional, including effective communication, goal setting and motivational behaviour change techniques. Finally, it introduces service implementation and evaluation. The course practical uses the evidence based exercises from the evidence based STARTER trial and theory from a recent Cochrane Review. Through workshops and case study it educates instructors to introduce, adapt, individually tailor and progress exercises according to the specific and differing needs of this patient/client group. Workshops include teaching in groups and on a one-to-one basis. The course content is delivered through lectures, practical workshops and self-guided learning. The tutor team on each course includes three experienced specialists in exercise after stroke: a consultant, a physiotherapist and an exercise instructor. You will meet the physiotherapist and exercise instructor on the face to face training and a specialist stroke consultant delivers the narrated power points on the online training portal. The Later Life Training tutor team is made up of physiotherapists and specialised exercise educators, with specific expertise and experience working in exercise after stroke and adult education. In addition to the Later Life Training tutor team, there are narrated power points given by Professor Gillian Mead, the Stroke Consultant behind the STARTER trial. Courses are run with a blended learning approach using an online portal (with approximately 12-14 hours pre-course work) and 4 days of face to face learning, including assessment days. The face to face days are spread over a period of 4 to 6 weeks to allow sufficient time between course days, for ‘home’ revision and set course work. The courses can be run on both weekdays and weekends depending on demand. Each face to face learning day runs from 9am to 6pm (36 contact hours) and approximately a further 100 hours of non-contact revision and learning time will be required, giving a total of approximately 150 hours for the course. LLT have developed an online training portal designed to give more flexibility, reduce travel costs and time required off work and allow theory elements of the training to be completed in your own time. LLT are still committed to face to face/practical workshops and all these remain in place for your training, it is the theory elements that lend themselves well to self-directed learning that are available on the online portal for your convenience. All online tasks must be completed within the time frames specified. Online elements are mandatory and a requirement. Candidates not completing them will be putting themselves at a disadvantage and may find the face to face days challenging if they are not prepared for practical workshops and tasks. Online tasks are monitored and supported by your LLT tutor and are required to be completed within allotted time frames to ensure you are fully prepared for each of the face to face training days. Following the online pre-course learning, the face to face training will focus on the leading and teaching skills of the EfS to prepare you for your practical assessment. There are 4 face to face training days with the LLT tutor team. These days are run over a period of 4 to 6 weeks to allow sufficient time between course days, for ‘home’ revision, and set online mid-course portal work. The courses can be run on both weekdays and weekends depending on demand. Each day runs from 9am to 6pm (36 contact hours). The face to face training includes assessment elements in line with Skills Active endorsement and QMU accreditation requirements (practical, theory paper and planning for case study submission). As part of the pre-course learning you will be sent a course manual covering theory and practice, together with a pack of the Powerpoint presentations. These are to be brought with you for the face to face training. All successful candidates will receive a Later Life Training Certificate in Exercise after Stroke. Those taking the course and not wishing to sit the assessments will receive a Certificate of Attendance. Please note that this may affect insurance and if you are an exercise professional associated REPs points will not be valid. The course is designed to offer an equivalent level of training to the Postural Stability Instructor and British Association of Cardiac Rehabilitation Courses and successful candidates with appropriate pre-requisite experience and qualifications are able to apply for Level 4 Specialist Exercise Instructor Status (20 points) with the Register of Exercise Professionals. If you are a REPs registered instructor, or hold insurance with another broker, before applying for a course with us you are advised to read the information regarding pre-requisite requirements, or contact REPS to be sure, this may impact on the validation of the insurance you hold. Students passing this module will gain a qualification at Scottish Qualification Framework level 8 in “Physical Activity and Health: Specialist Instructor in Exercise after Stroke”. This module follows the model of the well-established British Association of Cardiac Rehabilitation and the Department of Health development-funded Exercise for the Prevention of Falls and Injuries programmes. These courses are recognised by both health and exercise professionals as the gold standard in these specialist areas. It is anticipated that successful candidates will deliver sessions either working within the therapies in a hospital programme, or leading exercise after stroke sessions in community settings, as part of a local health improvement plan or onward referral from the Rehabilitation setting. The Scottish Government project “Exercise After Stroke” gives more information about setting up exercise services for people after stroke. There are also useful resources covering models of good practice in community stroke services on the Stroke Improvement site here. 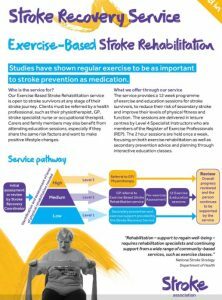 The Stroke Association have initiated a new ‘Exercise-based Stroke Rehabilitation service‘ where it signposts stroke survivors to evidence based exercise options. Clients must be referred by a health professional, such as their physiotherapist, GP, stroke specialist nurse or occupational therapist. The service provides a 12 week programme of exercise and education sessions for stroke survivors, to reduce their risk of secondary stroke and improve their levels of physical fitness and function. The exercise sessions are delivered by a specialist exercise instructor at the leisure centre who has completed the Exercise after Stroke (EfS) training course delivered by Later Life Training. A copy of the EfS Flyer is available to download. Welcome to the Exercise and Fitness Training after Stroke (EfS) Specialist Instructor Training Course. This course has been designed to provide exercise instructors and other suitably qualified practitioners with an accredited qualification, which will enable them to provide exercise classes that are safe, effective, appropriate and enjoyable for people who have had a stroke. This page details information about the background to this course, an overview of the evidenced-based exercises and course content, entry requirements, course assessment and qualification, cost, the original Course Development Team and Reference Group and the original Funders of the course. 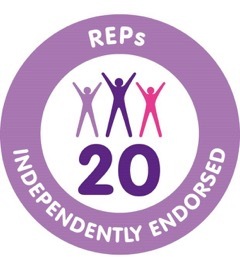 The course is fully approved at Level 4 status with the Register of Exercise Professionals and has the support of the key Non Governmental Organisations in Stroke. The course is recommended in the Best Practice Guidance for the Development of Exercise after Stroke Services in Community Settings November 2010, which can be downloaded from the Exercise After Stroke Website. This website is part of a Scottish Government funded project to scope the provision of Exercise after Stroke services across Scotland and to provide best practice guidelines for Exercise after Stroke. It also supports the Physical Activity and Exercise Recommendations for Stroke Survivors: A Statement for Healthcare Professionals From the American Heart Association/American Stroke Association, which can be viewed here. There is an increasing need for people who have had a stroke to engage in exercise, as a stroke often results in reduced strength, mobility, fitness and mood as well as social isolation. Many of these problems could be alleviated through exercise, but a stroke may also result in a myriad of additional challenges such as pain, impaired movement or comprehension, which may render it difficult for people with stroke to access exercise facilities. These challenges – as well as other complications – need to be recognised and managed effectively by exercise instructors to enable people to exercise safely. Providing exercise classes for people after stroke can be hugely rewarding – but this requires specialist knowledge and brings with it a considerable responsibility. Although there is an increasing number of exercise referral schemes for people who have had a stroke, there was – until recently – no accredited course for exercise instructors to work with this population. This accredited Exercise after Stroke Specialist Instructor Training Course has been designed to fill this gap. Read an article about the gap in provision following stroke. Read an article about the development of the EfS course from its original research base to its current provision by LLT. Read a summary prepared for the UK Stroke Forum on numbers of EfS Specialist Instructors trained in the UK since LLT took over the training. This includes pass rates, locations of courses and testimonials. Intercollegiate Stroke Working Party (2008). National clinical guideline for stroke (3rd edition). London: Royal College of Physicians. Department of Health (2001). Exercise Referral Systems: A national quality assurance framework . SkillsActive. National SkillsActive Physical Activity Standards for people after Stroke (Unit D561). Scottish Credit and Qualifications Framework Partnership (2006). Scottish Credit and Qualifications Framework (2001). The course is based on original research by the University of Edinburgh. Dr. Gillian Mead (team lead): Senior Lecturer and Honorary Consultant Geriatric Medicine, Department of Clinical and Surgical Sciences, The University of Edinburgh and Royal Infirmary of Edinburgh. Dr. Susie Dinan-Young: Senior Research Fellow Department of Primary Care and Population Sciences, Royal Free and University College Medical School , London, Director: Later Life Training Ltd.
Mr. John Dennis: Physiotherapy Team Lead Stroke North. Mr. Mark Smith: Consultant Physiotherapist, Stroke Rehabilitation NHS Lothian and Leith Community Treatment Centre, Edinburgh. Mrs. Sara Paul (nee Wicebloom), Senior Tutor on the Postural Stability Instructor Course, LLT and Lead on the Integrated Fitness Initiative. Prof. Marie Donaghy: Dean, School of Health Sciences, Queen Margaret University. Dr. Frederike van Wijck: Reader, Glasgow Caledonian University (originally from School of Health Sciences, Queen Margaret University). The course was developed by Queen Margaret University (QMU) and The University of Edinburgh, and validated by QMU. The course team is overseen by a multidisciplinary Reference Group, comprising committed individuals who have given their time, effort and invaluable expertise in reviewing the standard, content, organisation and delivery of this course. The Reference Group comprises more than 30 individuals, comprising specialists from a wide range of relevant professions: Consultants in Stroke Medicine and Geriatrics, stroke specialists in Physiotherapy, Occupational Therapy, Speech and Language Therapy and Nursing, Exercise Physiology and Exercise Science, Patient and Carer representatives, representatives from Patient Organisations (i.e. Different Strokes, The Stroke Association and Chest Heart Stroke Scotland), The Register for Exercise Professionals, SkillsActive, Health Promotion Officers, representatives from Edinburgh Leisure and Glasgow Leisure, The Scottish Government and senior academics in Stroke Care, Physiotherapy and Exercise & Health, as well as Exercise Science. The expert input from this group has been invaluable and the course team wishes to express their sincere thanks to the Reference Group for their contribution. The EfS Course is endorsed by PD:Approval (now managing endorsements of Skills Active) and REPS at Level 4. Associated REPs points are ONLY valid for professionals who are REPs members and who hold PD:Approval required pre-requisites for entry to this L4 course. The course is the only Exercise after Stroke exercise Qualification accepted by the Stroke Association as part of its Exercise-based Stroke Rehabilitation Service. The course is endorsed by the following key NGO’s: UK Stroke Association; Stroke Association Scotland; Chest Heart and Stroke Scotland; Chest Heart and Stroke Northern Ireland;Different Strokes. The course practical uses the evidence based exercises from the evidence based STARTER trial, published in the Journal of the American Geriatric Society and theory from a recent Cochrane Review. To view the evidence base for the EfS course, click here. There have also been some very positive service evaluations. To see these service evaluations, click here. It is the responsibility of the candidate to hold valid CPR, without this the qualification will not be valid. Candidates will take a 2 hour theory paper on Day 3. A Session plan is to be submitted as a hard copy on Day 4 for marking. On Day 4, candidates will teach and self-evaluate their teaching of an exercise after stroke group and one-to-one exercise session. This will include a warm up, followed by functional and strength exercises taught in a circuit, in a group and on a one-to-one basis, and flexibility exercises taught in a cool down. Particular emphasis will be placed on specific adaptations and progressions. A minimum of 40 minutes of teaching will be observed and assessed. Candidates will finally complete a Case Study on a patient after stroke, following viewing of a short film clip, and will be required to submit the written case study relating to this individual online 4 weeks after practical day. The full course cost is £670 + VAT per applicant and includes the Course Manuals, Assessments and Certification. Payment must be received at least 4 weeks prior to face to face training days in order to allow access to the online training portal. LLT offer discounts on courses, see if you qualify. If you wish to host a course we can offer further discounts if you can provide 12 candidates or more, please contact the LLT office. There are charges if you do not attend on your signed up assessment day. If you are a REPs registered instructor or hold insurance with another broker, before applying for a course with us you are advised to read the information regarding pre-requisite requirements, or contact REPS to be sure as this may impact on the validation of the insurance you hold. You can apply online here, but first we ask that you ensure you have read the Eligibility Guidelines and the statement about Medical Conditions and Learning Support Requirements below. You should also have read the EfS Terms and Conditions. Course dates can be found here. If there are no courses in your area at the moment, we will initiate a course as soon as there is enough interest but we cannot guarantee a timeframe for this. If you want to host a course in your area, please contact LLT. We do offer discounts to hosts depending on the number of applicants enrolled. View the Terms and Conditions for EfS course hosts here. Click here for information on Continual Professional Development courses for EfS. Many EfS instructors also qualify as PSIs.